Bromleigh McCleneghan and Lee Hull Moses have written a book about being not-perfect parents in a not-perfect world. The result, Hopes and Fears: Everyday Theology for New Parents and Other Tired, Anxious People, is a joyous celebration of child-rearing in which any parent no matter how perfect can share. 'I want to have a happy and healthy marriage, and I want to have happy, faithful kids,' proclaims co-author McCleneghan in the introduction to the book. 'But I reject the pervasive cultural lie that a happy marriage and the faithful kids are somehow the byproducts of some rigorous and largely unattainable personal or moral perfection.' Thus, Hopes and Fears is neither a 'how-to' book nor a mere meditation. Rather, the authors seek to find the beautiful and the spiritual in the sometimes mundane activities that parents have performed since the beginning of history, while at the same time allowing beautiful and spiritual insights of the past to inform and shape the activities of modern parenting. Thus, the words of a hymn can trigger an idea about how to deal with bedtime, and an exercise in baby-naming can lead to a better understanding of a passage in Isaiah. The intertwining of the spiritual and familial in this book constantly surprises and delights: a quote from Paul Tillich can stand next to one from Tina Fey or What to Expect When You're Expecting. We are often reminded that the authors, two longtime friends, are ordinary working mothers. Fortunately, they are also experienced and well-read congregational leaders, and they bring that perspective to their reflections. Hopes and Fears is also about sharing, in the widest and deepest sense of that word. As many parents know, learning to share is one of the most difficult things for many children to acquire. McCleneghan and Moses have decided to teach by example with this book, noting: 'we're hopeful that as we share our lives—the trials and tribulations and incredible joys—other parents will feel inspired to reflect on their own experiences, and perhaps even to consider new ways in which their own faith is relevant to their identities as parents.' 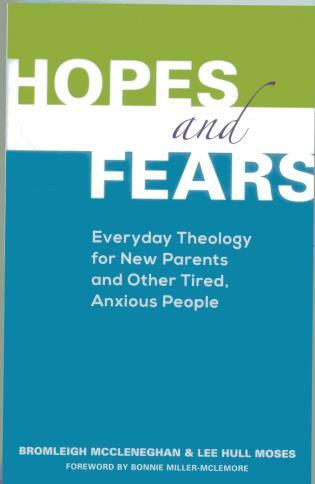 Hopes and Fears: Everyday Theology for New Parents and Other Tired, Anxious People is highly suitable for group study as well as individual reflection. After serving two United Methodist churches outside Chicago, and being ordained an Elder along the way, Bromleigh McCleneghan recently began as the Associate for Congregational Life at Rockefeller Memorial Chapel at the University of Chicago. She is a graduate of Boston University and the U of C. She and her husband Josh have two daughters, Fiona and Calliope. Lee Hull Moses is the pastor of First Christian Church (Disciples of Christ) in Greensboro, North Carolina. She is a graduate of Albion College and the Divinity School at the University of Chicago, where she was a Disciples Divinity House scholar. She and her husband Rob have two children, Harper and Jonathan.